Factory MSRP: $28,975 $2,392 off MSRP! 110V/150W AC Power Outlet, All-Weather Front & Rear Floor Mats, Exterior Parking Camera Rear, Fusion SE Hybrid Cold Weather Package, Fusion SE Hybrid Technology Package, Heated Front Seats, Speed control, SYNC 3 Communications & Entertainment System, Upgraded Sideview Mirrors - Heated, Voice-Activated Touchscreen Navigation System, Wheels: 17" Sparkle Silver Painted Aluminum. 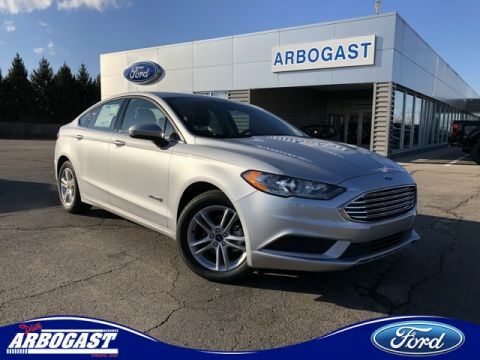 After 25 years of being driven to your satisfaction, the Dave Arbogast Family of Dealerships is proud to now serve Dayton and Troy area Ford customers! Visit us during our Grand Opening Sale going on now!